Arcane Legions was released today, so armed with a 15% discount coupon from Pair a Dice Games in nearby Vista, I picked up a two-player starter set and a Han booster set. 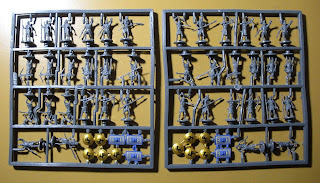 The starter set comes with two sprues of infantry and one commander for each of the major factions in the game. The figures are molded in a very dense gray plastic. Shields come pre-painted, with stenciled designs on the front. I was informed that CA glue works very well for attaching the shields and separate limbs to the figures. Boosters come with one rare hero, and two rare/uncommon specialty units. The figures are painted, and come individually sealed. The painting was not quite as awful as I was expecting, though some of the color choices seemed rather questionable. The hero figure is Zhongli Quan, a real-life Han Dynasty general who was deified as one of the Eight Immortals. The specialty units I received were the Wu Tou Gui and Goryo. 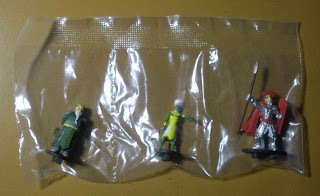 These figures come in linked bags of several identical miniatures. 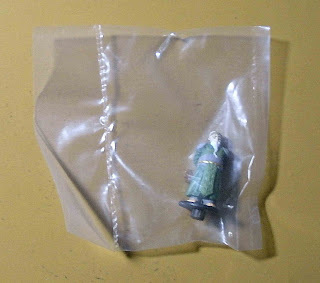 I think I am short one figure, since one of the bags for the Wu Tou Gui seems to be empty. I actually like these figures a lot. I don't know why, but translucent plastic miniatures just seem really cool. 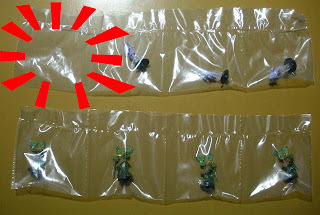 The Wu Tou Gui are molded in clear plastic, while the Goryo are molded in translucent green plastic. I removed the basing pegs from some of the figures to do size comparisons. I'm still deciding whether to do so for each pose or not. 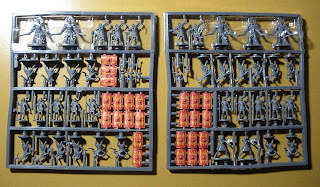 Zhongli Quan, Terracotta Spearman A, and Han Sharpshooter compared to Caesar Qin Dynasty Army. The standard Arcane Legions figures seem more slender than the Caesar figures, but I think they go well together. I like the fact that there are a lot of infantry with ge-halberds, something that is sadly deficient in the Caesar set. 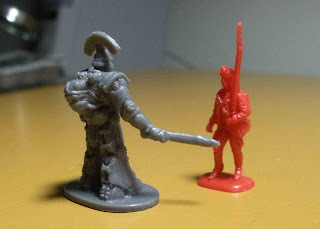 Cursed Swordsman and Cursed Spearman compared to Eagle Games Mummy. Very cool, but why are mummies always so tall? Arcane Legions Egyptian Archer compared to Caesar and Atlantic Egyptian archers. Arcane Legions Formation Legionary compared to Airfix, LW, and Atlantic legionaries. Also, a Heavy Legionary at the end, in apparently what is some sort of powered armor. Overall, I'll have to say I'm not disappointed. I like the Han and Egyptians the best. A couple of the poses seem a bit far-fetched (e.g. the Charging Han Infantry), and the sculpting is somewhat simplistic, but the figures are usable, and making them in 1/72 is definitely a plus. 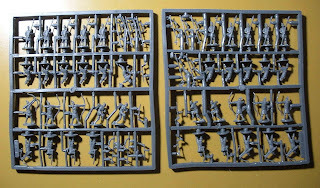 Images of all the figures can be found at the Arcane Legions website. Note: I have been told that it is normal for boosters to come with bags that are empty, so long as there are 5-11 figures in the box. It sounds a bit dodgy, but that's the story. I'd be interested to hear if anyone else encounters this problem.